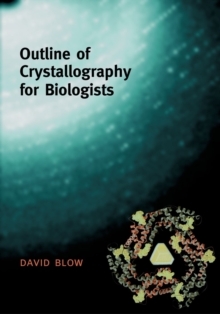 Outline of Crystallography for Biologists is intended for researchers and students in the biological sciences who require an insight into the methods of X-ray crystallography without needing to learn all the relevant theory. The main text is purely descriptive and is readable by those with minimal mathematical knowledge. Some mathematical detail is given throughout in boxes, but these can be ignored. Theory is limited to the essentials required to comprehend issuesof quality. There is an extensive reference section and suggestions for further reading for those who wish to delve deeper. The first part 'Fundamentals' presents the underlying ideas which allow x-ray structure analysis to be carried out and provides an appropriate background to courses in structural determination. The second part 'Practice' gives more information about the procedures employed in the course of crystal structure determination. The emphasis is on the quality measures of X-ray diffraction analysis to give the reader a critical insight into the quality and accuracy of a structure determination and to enable the reader to appreciate which parts of a structure determination may have caused special difficulty. There is no pretence of completeness and many matters discussed in standard crystallography texts are deliberately omitted. However, issues not brought out in the standard texts are discussed, making it a useful resource for non-practising crystallographers as well.